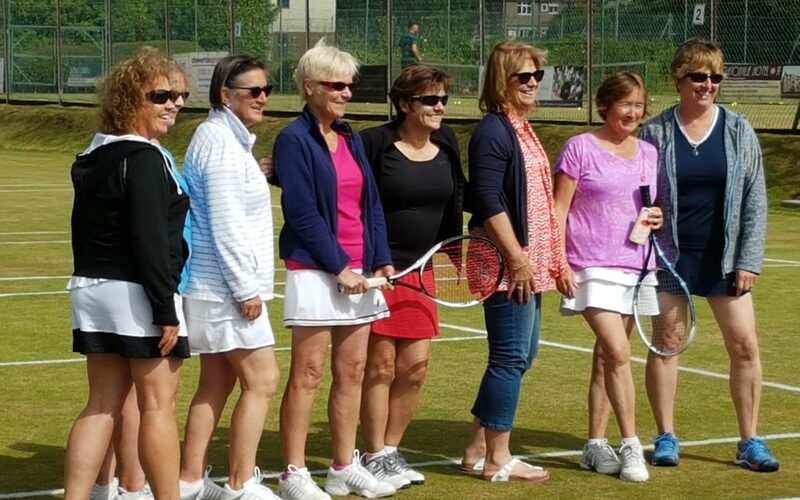 On Thursday 28th June, in beautiful sunshine Cromer LTC hosted its annual Ladies Day. This involved a ladies doubles tournament and lunch with 27 pairs from over the County competing in 4 groups. A wonderful day of tennis on the grass ! 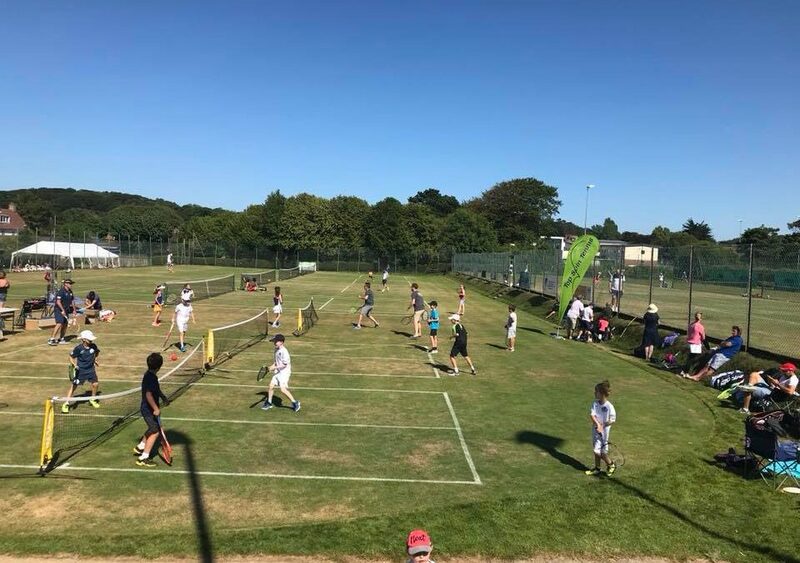 Sunday 1st July saw the clash of the counties, Suffolk Titan Tennis players travelled to Cromer tennis club to take on both Cromer and Tennis Edge players in this charity tournament. Over 70 players attended and participated in a total of 90 matches on Sunday afternoon, all basking in the glorious weather. Families arrived in their car loads to enjoy an afternoon of tennis spectating washed down with a delicious BBQ and refreshing beverages from the bar. From player entry fees and raffle a total of £1,460 was raised for Cancer Research UK, a cause very close to the heart of Paul Hope, director of Titan Tennis who came up with the idea of this Charity Event. The afternoon saw some fantastic matches, some players playing on grass for the very first time. There were some very close matches, running into three sets and tie breaks. Every match shows fun, sportsmanship and skill. If the players weren’t competing then they were having fun on the mini courts. The end of the tournament signalled time for the parents and coaches to pick up their rackets and take to the courts with Ross Murray from Cromer and Marco Mitev-Will from Titan battling it out on court, followed by Marco and Asa Sumner-Keens in a very close three setter. Dads also participated with doubles matches against coaches and one another. A fantastic afternoon, all in aid of a fantastic charity. 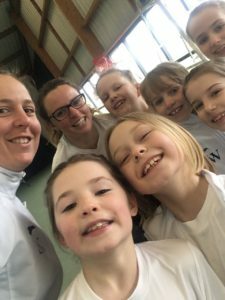 NORFOLK SCHOOL GAMES – Mini Tennis event a big hit! 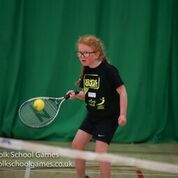 On day 1 of the Norfolk School Games 128 eager tennis proteges from schools across the county took to the indoors halls a the UEA Sportspark. All eight School Sports Partnerships had previously held qualifying events, with the top four teams progressing to todays county finals. Each school competed in a knockout competition, with every team guaranteed five matches. With 4 players in each school team this amounted to over 80 matches! The atmosphere was electric with players raring to go from the start. The matches continued thick and fast, with team mates cheering their friends on. Every point was to play for as tied results would mean a countback on points won. (this happened on several occasions due to the closeness of the competition). The semi finals were tense affairs with Catton Grove narrowly edging out North Wooton. In what had to be the match of the day, Woodlands A clinched the match against Hethersett A by virtue of winning the No.1 Singles match. The teams were tied at 2-2 and also tied on the same number of points! In the final, Catton Grove came through to claim the title against Woodlands A, with Hethersett A winning the 3/4th play off with North Wooton. Schools who lost there first match continued to play off to determine a placed finish. In the end, having won all four of there remaining matches, St Francis of Assisi defeated Blofield to win the consolation event. The trophies and medals were handed out by She Rallies Ambassador for Norfolk, Kim Burgess. On the day Kim also managed to get 3 more teachers signed up for a ‘Mishits’ workshop. An LTA initiative aimed at providing teacher/training to support female members of staff with coaching ideas to deliver to girls aged 5-8. Everyone of today’s competitors has received a letter inviting them to a FREE taster tennis session at one of the above listed clubs. Enjoy Wimbledon 2018 and keep practising! 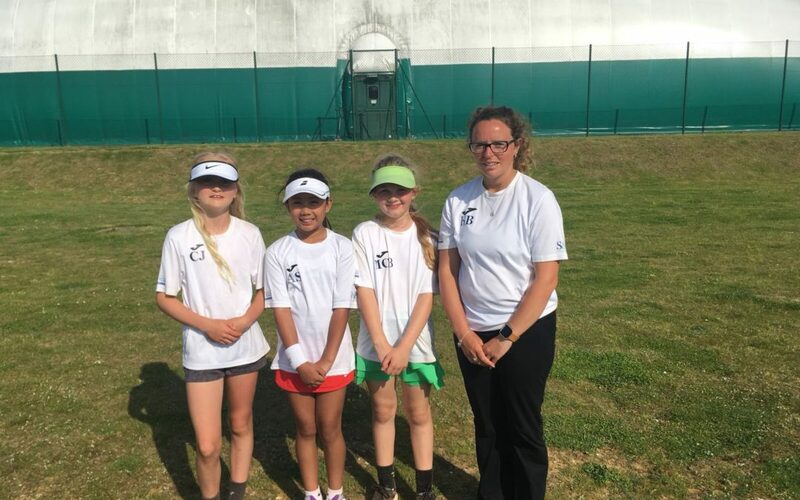 10u county cup was on the weekend of the 26th/27th May, the Norfolk girls were at Easton Tennis Centre, so for once did not have far to travel, which was a novelty for us – yet a shock for Middlesex! The team consisted of Anghela Sionosa, Charlotte James, and Matilda Cabrera – Burns. After an extra team training session during the week the girls were ready to compete. In Norfolk’s group was Middlesex, and Suffolk. The other group consisted of Essex, Cambridgeshire and Bedfordshire. Each tie is 3 singles and 1 doubles. First up for Norfolk was a very strong Middlesex team, the girls fought really hard however whatever our girls did the ball came back stronger. This was a tough start for them but it got them nicely warm and used to some hard hitting. Norfolk lost all 3 singles against Middlesex. They then played Suffolk, the girls looking more confident as a team. Matilda was up first, she had a close match but managed to stay in front all of the way through and getting Norfolk’s first win. Charlotte battled well however Erin from Suffolk was just more consistent, making the score 1-1. Anghela was too good for her opponent on the day and took the score to 2-1 in Norfolk’s favour. Matilda and Charlotte went on and played the doubles against Middlesex, the outcome was very much like the singles – Middlesex finishing on top. Matilda and Anghela played the very important doubles against Suffolk, they got off to a great start to go 3-1 up however the Suffolk team made a come back. Norfolk won the first set in a tie-break. They then took the second set more convincingly to mean Norfolk had beaten Suffolk 3-1, a great result which meant they finished second in their box. Day two started with a tough semi final against Essex, all of the Norfolk girls played some of their best tennis, however Essex were too strong and won all of the singles, and the doubles to win 4-0. This meant that Middlesex and Essex were in the final, and Norfolk would play Cambridgeshire for 3rd and 4th place. Anghela and Charlotte were on first, both worked hard but couldn’t convert their matches so we went 2-0 down. Matilda then played the match of the weekend for us, and won in 3 sets The final set was 11-9 in the match tie-break. After this long match Matilda was too tired for the doubles, so Charlotte and Anghela played the doubles to try and make the score 2-2. They played well as a team however Cambridgeshire got the win to make it 3-1to Cambridgeshire. Norfolk finished 4th over the weekend with Middlesex being the eventual winners. The girls fought hard all weekend and learnt a lot about working and supporting each other as a team. A very positive weekend was had by all. Thanks to the players and parents for their effort and support. 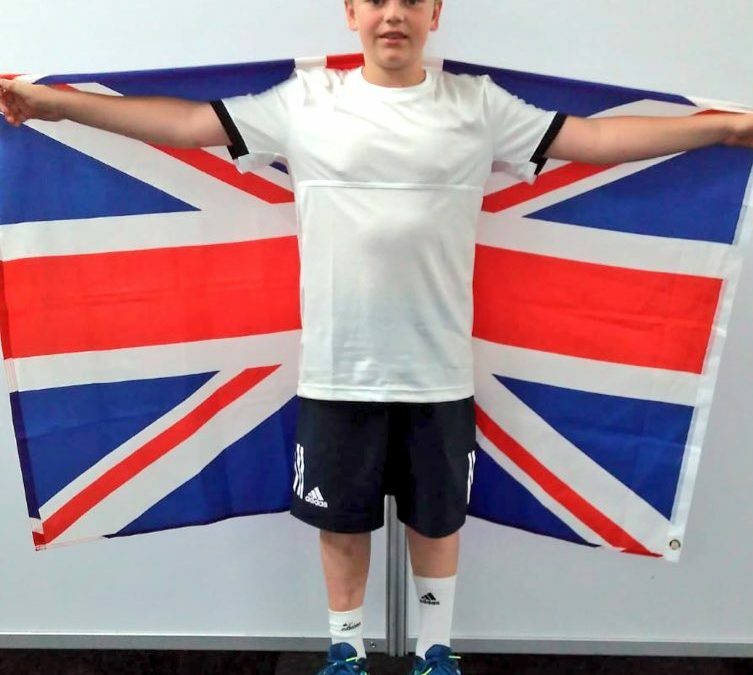 NLTA Newsletter 2019 – Out Now!